QCT with HyperStore® software makes it easy to build and manage full-featured, Amazon S3-compliant cloud storage, on-premises for data processing and archive. QCT solutions provide workload optimized, multi-data center storage, unlimited scale, fully automated data tiering to the cloud, and support for all S3 Applications all behind your firewall. QCT appliance provides the most scalable end-to-end easy-to-implement Object Storage solutions the market has to offer. Now world-leading QuantaGrid servers are pre-loaded with HyperStore simplifying deployment and enhancing end user experience. The modular design easily to scale from branch office to rack-filled datacenters. Data comes in many shapes and sizes with a wide range of use cases such as data analytics, file sharing, backup and archive. The rapid advancement of object storage technologies fuel the drastic increase of the number of data sources and the variety and volume of data that are useful for analysis. To effectively process the ever increasing volume of data and the complex workloads of analytics, QCT offers enterprise class scalable platform to power the most demanding cloud computing solutions in the industry. 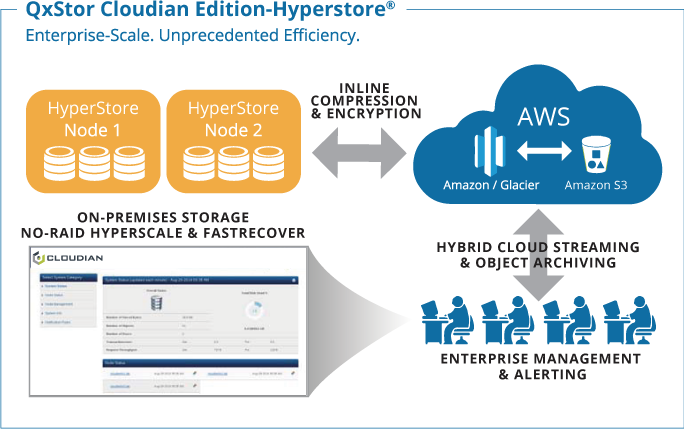 HyperStore® provides enterprise-grade storage solutions for private and hybrid clouds. HyperStore®, is an S3-compatible storage platform that enables scalable, secure, and cost-effective hybrid cloud storage solutions. You can deploy HyperStore as software to be implemented atop your existing storage infrastructure, or as a fully integrated rack-ready appliance. Both deployment options deliver multi-data center storage with no constraints on data size, unlimited scale, optional data tiering to any S3 cloud, and support for all S3 ecosystem applications—on-premises, secure behind your firewall.